Phil Brown admitted he jumped at the chance to sign midfielder and former Preston North End youngster Richie Baker. 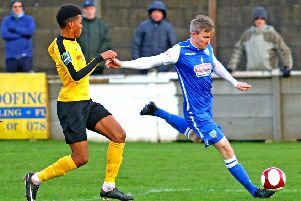 The 30-year-old became Lancaster City’s latest summer acquisition when he signed on the dotted line at the Giant Axe last weekend. Having been a youth team player at Manchester United, Baker was released in 2005 when he was picked up by Preston. Although he never made a first-team appearance at Deepdale, he did enough to earn a deal with Bury and enjoyed a four-year stint at Gigg Lane. He is no stranger to the City boss – the pair worked together at Stockport County and Brown admitted it was a no-brainer to bring him to the club. “I have known Richie from my time at Stockport County,” said Brown. “He impressed me a lot. He’s very technical and has also got a bit of an edge to his game. “When I found out he was available after leaving Curzon Ashton, I was keen to bring him in. Brown was also really pleased to entice Steve Williams to sign another deal with the club. The defender was hampered by fitness issues for a large part of last season. Recovering from a double hernia, Williams worked extremely hard to get back on the pitch and eventually made 13 appearances for the Dolly Blues. Brown is hopeful that with a full pre-season behind him, he will be able to make a full contribution to the team for the forthcoming campaign. “Willo is a quality player,” said Brown. “I’m delighted to get him down back at the club . “He’s played in the Football League and for some big non-league clubs. “He’s spent a long time out of the game with a double hernia and that was always going to hamper him last season. “He’s worked really hard to get his fitness back up to speed. The players report back to pre-season training this evening, with their first friendly game scheduled for a week on Saturday against Morecambe at Giant Axe. The day has been earmarked as a Family Fun Festival. There will be attractions such as bouncy castles and facepainting for children and all money raised will be donated to the charity, Unique Kidz Co.